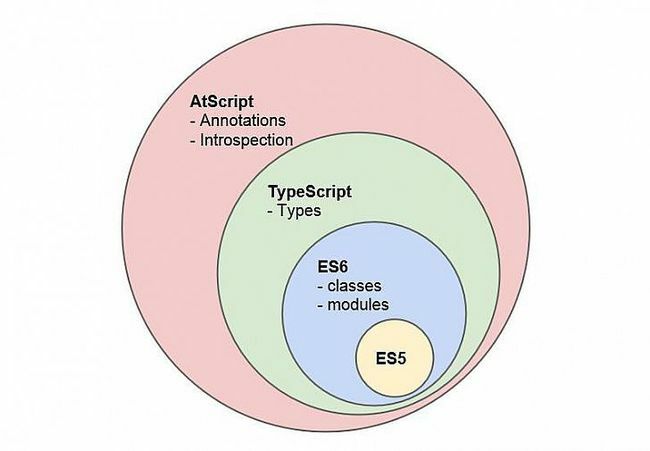 This partnership has helped TypeScript to evolve additional language features among which we will highlight annotations. Annotations, a way to add metadata to class declarations for use by dependency injection or compilation directives. Annotations was an proposed by the Google AtScript team but annotations are not a standard. However, decorators are a proposed standard for ECMAScript 7 by Yehuda Katz, to annotate and modify classes and properties at design time. Annotations and decorators are nearly the same thing. From a consumer perspective we have exactly the same syntax. The only thing that differs is that we don’t have control over how annotations are added as meta data to our code. Whereas decorators is rather an interface to build something that ends up as annotation. Over a long term, however, we can just focus on decorators, since those are a real proposed standard. AtScript is TypeScript and TypeScript implements decorators. Let’s take a look to the TypeScript’s decorators syntax. Note: If you want to learn more about the difference between Annotations and Decorators there is a great article by Pascal Precht on this topic. As we can see, decorators can be used to annotate a class, property, method or parameter. Let’s take a in-depth look to each one of these types of decorators. Now that we know how the signature of a decorator looks like we can implement some of them. We are going to start by implementing a method decorator. Let’s create a method decorator named log. Before we can actually use @log we need to declare the method decorator somewhere in our application. Let’s take a look to the log method decorator implementation. Note: Please take a look to updates at the end of this post for an alternative implementation, which a avoids one potential issue. target the method being decorated. key the name of the method being decorated. value a property descriptor of the given property if it exists on the object, undefined otherwise. The property descriptor is obtained by invoking the Object.getOwnPropertyDescriptor() function. There is something strange right? We didn’t pass any of these parameters when we used the decorator @log in the C class definition. At this point we should be wondering who is providing those arguments? and Where is the log method being invoked? We can find the answers to these questions by examining the code that the TypeScript compiler will generate for the code above. But when we add the @log decorator the following additional code is added to the class definition by the TypeScript compiler. If we read the MDN documentation we will learn that the following about the defineProperty function. The TypeScript compiler is passing the prototype of C, the name of the method being decorated (foo) and the return of a function named __decorate to the defineProperty method. The TypeScript compiler is using the defineProperty method to override the method being decorated. The new method implementation will be the value returned by the function __decorate. By now we should have a new question: Where is the __decorate function declared? If you have work before with TypeScript you may already know that when we use the extends keyword a function named __extends is generated by the TypeScript compiler. In a similar manner, when we use a decorator a function named __decorator is generated by the TypeScript compiler. Let’s take a look to the __decorator funcion. Note: We will focus on the metadata reflection API towards the end of this post series so let’s ignore it for now. Let’s remember how did we get here for a second. The method foo is about to be override by the return of the function __decorate which was invoked with the following parameters. We are now inside the __decorate method and because the metadata reflection API is not available, a fallback is about to be executed. Because 4 parameters are passed to the __decorate method, the case 4 will be executed. Understanding this piece of code can be a challenge because the name of the variables are not really descriptive but we are not scared of it right? Let’s start by learning about the reduceRight method. The reduceRight method applies a function against an accumulator and each value of the array (from right-to-left) has to reduce it to a single value. Who is providing those arguments? Where is the log method being invoked? If we return to the log decorator implementation we will be able to understand much better what happens when it is invoked. After decorating the foo method it will continue to work as usually but it will also execute the extra logging functionality added by the log the decorator. var r = c.foo(23); //  "Call: foo(23) => 46"
It has been a journey right? I hope you have enjoyed as much as I have. We are just getting started but we already know enough to create some truly awesome stuff. Method decorators can be used for many interesting features. For example, If you have ever worked with spies in testing frameworks like SinonJS you will probably get excited when you realize that decorators are going to allow us to do things like create spies by just adding a @spy decorator. In the next chapter of this series we will learn how to work with Property decorators. Don’t forget to subscribe if you don’t want to miss it out! There has been some changes in the original content due to issues. Please if you have spot any problems let me know at @OweR_ReLoaDeD and I will post updates here. In the original article an arrow function => inside the log decorator was used. The arrow function interferes with the value of this in value.value.apply(this, args), which ought to be passed straight through unchanged. It is also recommended editing the descriptor/value parameter and return that instead of overwriting it by returning a new descriptor. So we keep values currently in the descriptor and won’t overwrite what another decorator might have done to the descriptor. // decorator might have done to the descriptor. Please check out this stack-overflow answer for more details about both issues. Announcing InversifyJS 2.0.0 Release Candidate ?